The new year has begun and Christmas seems like a distant memory. Only a few weeks ago we were frantically running around the shops in search for the perfect gifts for our loved ones and now all the madness has gone, I would like to share with you a little something that has proved to be a very successful gift. Men are notoriously difficult to buy for when it comes to present shopping. They fob you off with the line, "You don't have to buy me anything, it is ok" and then get really annoyed if you do follow their advice. 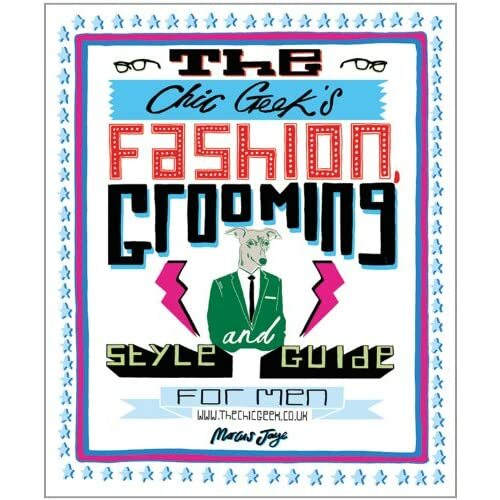 That is why this year, or should I say last year, I ventured down a new route and purchased 'The Chic Geek's Fashion Grooming and Style Guide" by Marcus Jaye as a present for my Dad. The book is not your average style guide. It doesn't try and make everyone look the same or conform to the same style, it presents a series of honest tips and advice on dressing, mixed in with a light hearted dose of fashion history. It's pages are beautifully set out with kooky cartoons and iconic photographs all vying for your attention and each section of the book is clearly identified for ease of use. The humorous style of writing and eye catching editorials have already caught the eye of industry giants such as the designer Paul Smith, who has written a foreword for the book explaining the importance of stylish dressing and the necessity to pay attention to the smallest of details. The book contains the perfect balance of fashion history, practical advice and inspiring imagery which will keep you entertained for hours and will definitely teach you the difference between the Morning suit and the Lounge suit. The Chic Geek, whose identity remains anonymous, takes the reader on an exciting and vibrant tour of menswear allowing them to be subtly educated and transformed into the 'best version of themselves that they can possibly be'. The book also accompanies the Chic Geek website which provides indepth detail on how to be a Chic Geek and develop a classic style. This book is definitely worth buying and I can assure you, it is not just men who will enjoy reading it. I am a girl and this book provides me with a fantastic introduction to menswear. I bought my copy on Amazon but you can also visit their website for more information about the book.